York, Pennsylvania has had a literary community for a long time, decades even. But never before has the written and spoken word been this loud, this important, this… everywhere. Thanks go in large part to Carla Christopher. The current poet laureate, who is now finishing her third and final year at the position, would give the thanks right back to her city. “The thing I love about York right now is that we’re in this magical place in time where the government has recognized that there is this need for an active and participatory support for arts and culture,” she said in our interview last month. 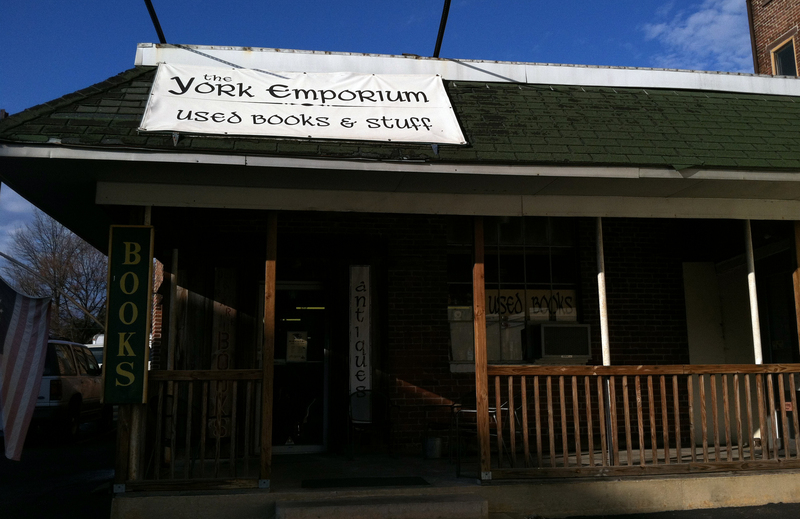 We met up with Carla at The York Emporium, a book/antique/vintage store in the 300 block of West Market Street. There was stuff crammed in every nook, with decor ranging from Christmas-light covered palm trees to lava lamps (we counted at least 40). 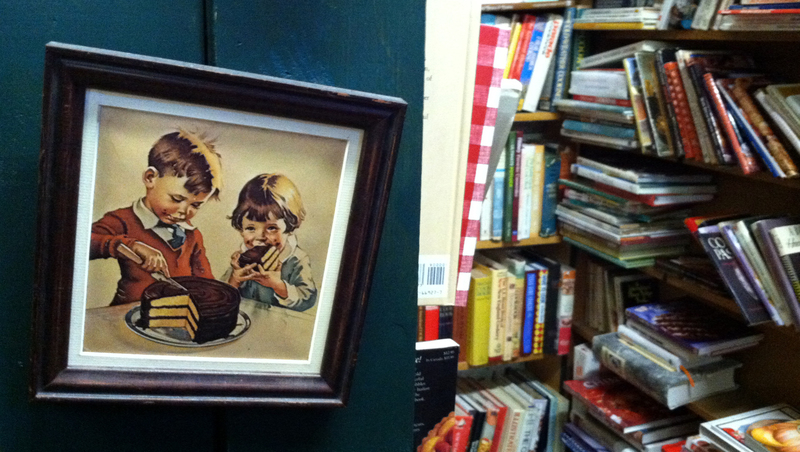 Holiday music played overhead while customers dug through a bin of ephemera, turning over piles of abandoned school diplomas, old postcards, photographs, and church programs. A son and daughter played a vintage video game while the store owner, Jim Lewin, offered us free coffee. “There were Christmas cookies, but they’re gone,” he said, brushing a few crumbs into a garbage can. 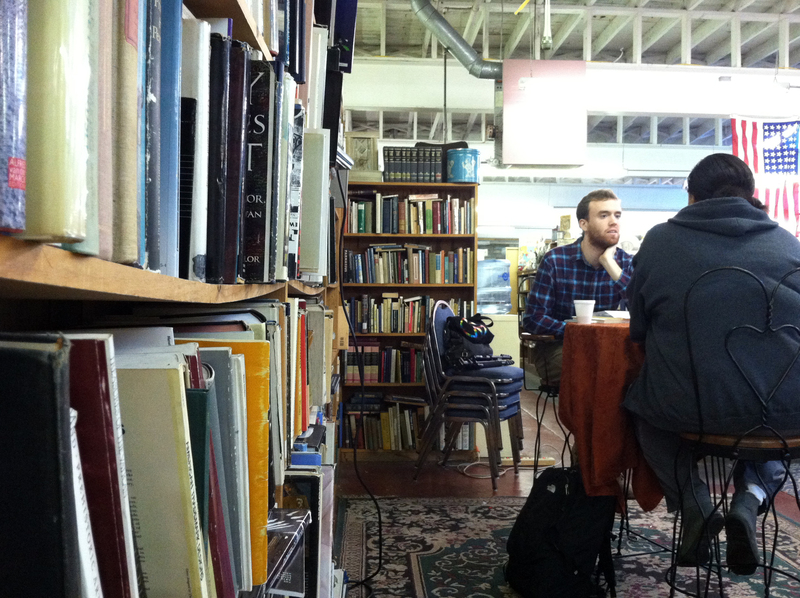 The Emporium is a literary monument in and of itself, featuring poetry slams, Science Fiction author meetups, NaNoWriMo groups, and book discussions on a regular basis. When Carla arrived, it became clear that the expansive York lit community is closely connected, as she and Jim nodded a hello and exchanged greetings. During our interview Carla described her move from Baltimore to York six years ago as a “major culture shock”. This isn’t to say that York didn’t have an arts scene, but alludes to the quieter, more compartmentalized nature of the local artistic community in 2007. This would change after she met York’s first poet laureate, Carol Clark Williams. It was at the poet’s workshop series (which, at the time, occurred monthly in the very spot where we met Carla) that Carla, “fell in love with the accepting nature of the writers… the joy of creating something on the spot.” This is also where Carol told Carla about the laureate position and urged her to apply. Since taking the reigns as laureate in 2011, Carla has facilitated incredible developments in the community. The job description for this voluntary office states that the duties of the laureate are to develop projects to promote an awareness of poetry in the community, to keep poetry a significant presence in the culture and the community at large, and to promote literacy, particularly among students and young people. Her other projects are equally diverse and important. She hosts a weekly TV show on White Rose Community Cable called Culture & Main where artists of all genres and renown are recorded and interviewed. They currently have 40 episodes (available on YouTube) that have profiled over 150 local artists. This works to raise awareness about all of the arts in Pennsylvania. The more people know what is happening, the more it is going to grow. The result: more people can find ways to express themselves and connect with their own communities. Carla is all about amplifying the voices of the citizens of York. This is observed most clearly in her work with her publishing press, Poemsugar Press. Poemsugar’s eight books (six more currently in the works) are penned by first time authors, writers from marginalized communities, people who “…might not necessarily know how to navigate the larger publishing world, those who might be taken advantage of…niche writers who have talent and something to say,” said Carla. Poemsugar has provided an outlet for the voices of York writers who are GLBTQIA, young, mentally ill, or oppressed. She works closely with each author, moving through the entire editing, design, and marketing process with each of them. Carla even works to secure local readings for her writers in the York, Lancaster, and Harrisburg areas. These writers are getting a level of special attention and promotion that exceeds that of many other small presses. So what does all of this mean for a community like York? Besides the obvious fact that these different projects and venues welcome citizens from any status or category to participate in art, to have their voice heard and amplified, one could argue—and if one were Carla, one would—that the literary community is making strides as bright and loud as any of the local arts to keep this city alive and hopeful in the wake of recession. Carla said, “We’re an area that’s become challenged economically. We’ve lost a lot of our factories and production. What is going to draw people to York? What is going to keep us afloat so that we’re not the desert wasteland that a lot of these abandoned industrial middle class cities have become?” Questions like these are being answered not only by the arts community as a whole, but by the government as well. This is evidenced in York’s artist housing subsidies, tax breaks for homes used as venues, and something as seemingly insignificant but wholly purposeful as daily free parking downtown after 5pm. Not to mention that the poet laureate office (which Carla was urged into by Carol and urged into keeping for three years by the City) is still up and running, strong as ever; they’re actively searching for Carla’s successor now. The first question we asked Carla, sitting down at a tall, wobbling table in the nook of the York Emporium’s poetry-section, was “Why is poetry important?” And as Carla explicated an impressive list of reasons, we began to feel at home with yet another person who “gets it.” By the close of the interview, it was clear that the city of York, Pennsylvania “gets it” as well, and is dedicated to supporting artists of all types to ensure a vibrant, diverse, and economically sound community. The Triangle works to foster a diverse, innovative literary culture in south central Pennsylvania, making it a place where writers, poets, artists, and literature enthusiasts can thrive together in a supportive and engaging community. ©2018 The Triangle. All Rights reserved.